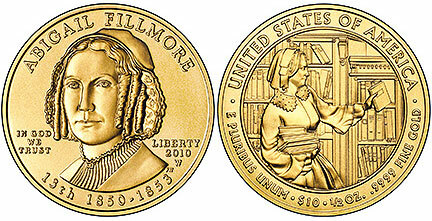 Today March 18, 2010, the United States Mint began sales of the 2010 Abigail Fillmore First Spouse Gold Coin. This is the first release of the year for the series created to honor the Nation’s first spouses. This represents the fourteenth release of the series overall. The Abigail Fillmore First Spouse Gold Coin features a portrait of the First Lady on the obverse, along with inscriptions indicating the order of the Presidency and the years of the Presidential term. Her husband Millard Fillmore served as the 13th President from 1850-1853. Additional obverse inscriptions include the First Spouse’s name, the motto “In God We Trust”, “Liberty”, and the year of issue. The reverse of the coin depicts a scene of Abigail Fillmore shelving books in the library that she established in the White House. The authorizing legislation for the series states that the reverse design “shall bear images emblematic of the life and work of the First Spouse whose image is borne on the obverse.” Abigail Fillmore had acquired several hundred volumes to establish a permanent White House library on the second floor oval parlor. Reverse inscriptions include “United States of America”, the motto “E Pluribus Unum”, the nominal face value, and the weight and purity of the gold content. Each coin contains one-half ounce of 24 karat gold and carries a nominal face value of $10. Coins are struck at the West Point Mint in proof and uncircualted versions. There is a maximum mintage of 15,000 coins across both versions. This maximum mintage was reduced from levels used for previous releases of the series. The proof version of the coin has been priced at $729 and the uncirculated version at $716. Under the US Mint’s pricing policy for numismatic gold and platinum coins, these prices may be adjusted as often as once per week in response to the changing price of the underlying precious metals. The United States Mint also began sales for a 1-5/16 inch bronze medal featuring the same design as the gold coin, but with some inscriptions removed. The medals are priced at $5.50 each.